If, as is often stated, the Yankee dryer is the Heart of a tissue machine, then the steam and condensate (S&C) systems can certainly be referred to as its Lifeblood. Analysis and optimization of S&C flow can give a mill useful new tools to help lower energy consumption, while also addressing problems like uneven moisture profiles and sheet breaks. Based on experience with Yankee steam and condensate (S&C) systems running on tissue machines around the world, it is clear that there is a very wide range of performance on these operations. There are some mills and companies that have deep expertise in using and optimizing S&C systems to get the best sheet quality and runnability with the lowest energy consumption. On the other hand, other mills have relatively little in-house experience and, as a consequence, often struggle with their Yankee operations on problems like cross-direction (CD) quality, runnability and energy costs. Based on development work we have recently carried out, BTG has come up with a tool called the Steam & Condensate Cookbook. The customers who can benefit most from this tool are those who reside in the lower half of the industry averages for S&C efficiency and/or Yankee performance. No papermaker likes to think they are scoring in the lowest half of any benchmark, so if you are sometimes struggling in this area, you may find this information very useful. Here is how it works. Modern Yankee condensate systems normally consist of 4-12 headers with several soda straws (small syphons) feeding each header. Each header normally has a straw about every other groove. The straws are mounted either out of both sides of the header, where there is a straw every fourth groove, or perpendicular from the bottom of the header, where these is a single row of straws in every other groove. The S&C system’s primary function is to evenly evacuate the condensate from the internal grooves of the Yankee and carry the steam and condensate mixture to the separator. In the separator, the condensate is removed and either flashed to lower pressure steam or returned to the boiler house for reuse. The steam is returned to the process via the suction side of the thermocompressor (TC) and is mixed with higher pressure steam and sent back to the Yankee. Yankees are controlled by either differential pressure control (dP) or by blow-through (BT) control. dP control uses the pressure drop across the Yankee to control the S&C flow. If dP is low, the TC opens to create more suction flow, which in turn increases dP to the set point. If the dP is high, the TC closes to reduce suction flow and reduce dP. Normally, a make-up valve is required to provide additional high-pressure steam to reach the Yankee pressure set-point. BT control uses a calculated straw tip velocity to ensure adequate steam flow to evacuate the condensate from the Yankee. There is a flow control valve located between the separator and TC. This valve controls the straw tip velocity to a set point, normally between 45-70 m/s. The TC is sized to provide adequate suction flow to meet the requirements of the designed tip velocity. The TC is programmed to meet the Yankee pressure set point. If the TC is open to 100% and the Yankee pressure set point, then the make-up valve will provide additional high-pressure steam to meet the set point. –Total drying energy per unit of production. Fig. 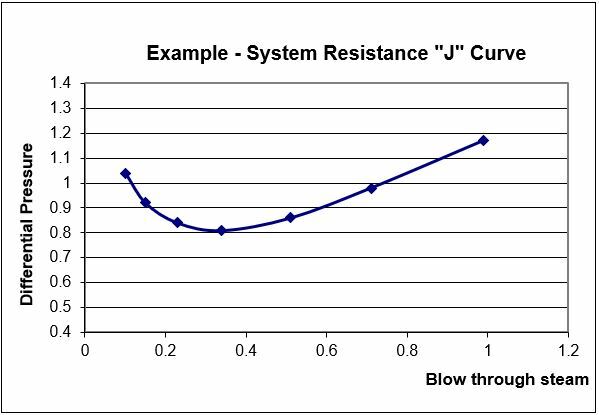 1: The J-curve, showing dP versus steam/condensate ratio. Ultimately, the tissuemaker wants a Yankee cylinder with as uniform a Yankee thermal profile as possible. This means both in the cross direction (CD) and the machine direction (MD). 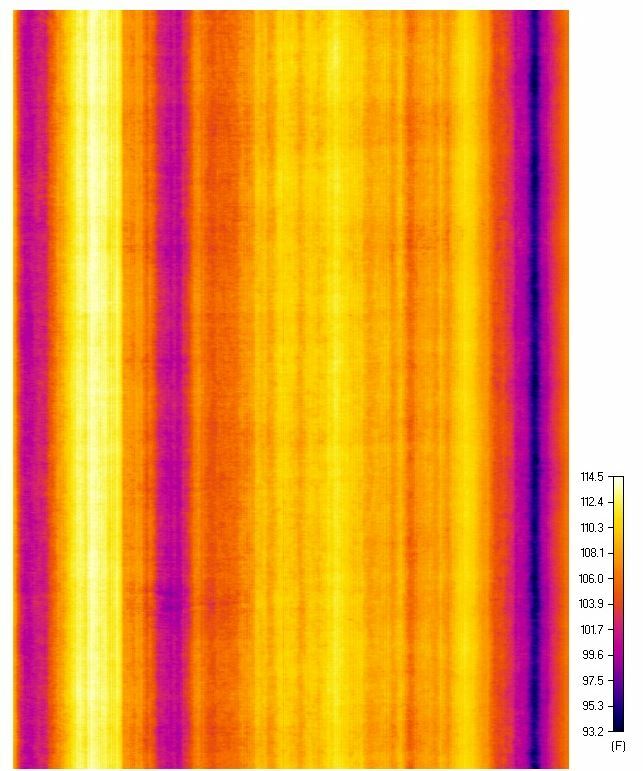 Even the simplest infra-red (IR) cameras do an adequate job at seeing CD temperature variation even at a 30 Hz data acquisition rate, so this is a good starting point. Using this data, the mill can change the dP or BT set point, both up and down, to determine the set point which will provide the most uniform CD Yankee thermal profile. IR cameras are recommended for this task, not laser point IR meters. 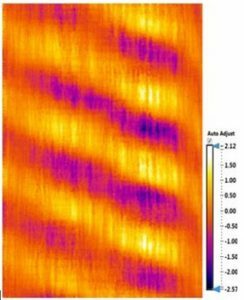 The more difficult challenge is to accurately measure the MD thermal profile fast enough for optimization. Normally, this requires a line-scanning IR technology where data acquisition speeds can be as high as 5000 Hz. Most IR cameras operate at less than 60 Hz. 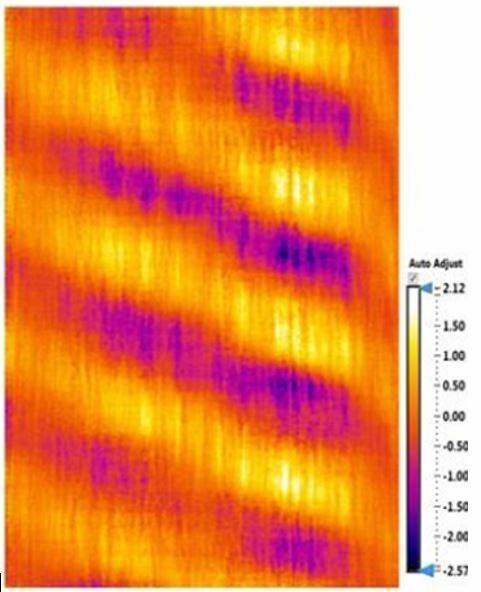 Line scanning technology creates a detailed CD and MD matrix of temperatures. Once the high speed thermal data matrixes are measured, they can be normalized to take out most of the CD influence and look more clearly at MD thermal variation on the Yankee. 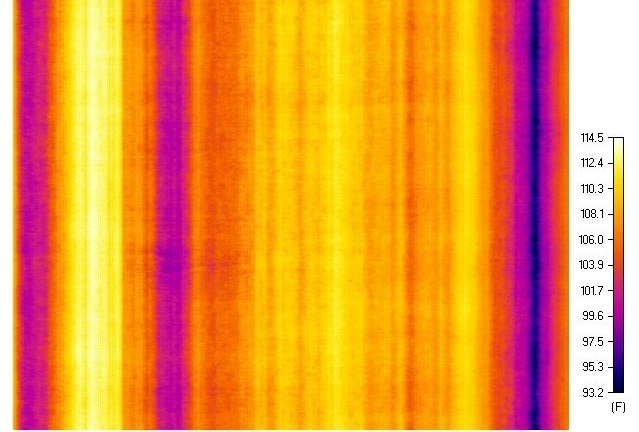 Furthermore, several revolutions of thermal matrixes can be measured and a fast Fourier transform algorithm (FFT) to applied to determine specific frequencies of MD thermal variations. Again, in these cases, the dP or BT, can be changed, both increased and decreased, and the most optimum CD and MD thermal profile can be determined. The advantages of reducing thermal deviation to the extent possible are well known to tissuemakers due the direct effect on sheet quality, breaks, and blade life. 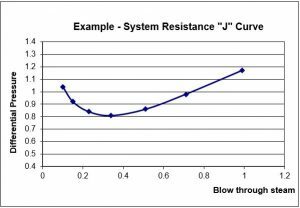 Pressure drop in two-phase flow is a major design variable, governing the motive power required to transport two-phase fluids and also governing the recirculation rate in natural circulation systems. The pressure drop in a Yankee recirculation system is influenced by the weight ratio of vapor and liquid in the two-phase flow. The optimum ratio will vary somewhat based on the S&C system design. It is important to note that if the steam/condensate ratio is either too high, or too low, the dP will increase and the system will not function optimally relative to energy usage or thermal uniformity. The tissue market is extremely competitive and margins are thin, but volumes are high. Therefore, incremental savings are very important because they are multiplied over large volumes of product. The S&C cookbook, coupled with high speed IR analysis, is a way for tissuemakers to gain savings by significantly improving the overall thermal profile of the Yankee dyer. Among the common problems that can be solved with the new S&C cookbook method are issues such as: 1) high moisture (flooded edges), 2) dysfunctional Yankee internals, 3) venting due to numerous reasons 4) high or low dP 5) high or low straw tip velocities 6) dysfunctional or incorrectly sized TC 7) non-optimum two-phase flow. Finally, S&C systems are normally always operated at the same set points. This is fine if the machine makes the same grade . . . at the same speed . . . with the same felt . . . all the time 24/7/365. However, this is almost never the case. Basis weights change, so condensing rates change, and the two-phase ratio changes. Furthermore speeds change, so the tip velocity required to optimally evacuate the Yankee also changes. In fact, it’s normally during periods of rapid changes – like start-ups, grade changes, or speed changes – that Yankee problems can start. Understanding the Yankee thermal variations relative to several key indicators generated by the S&C cookbook can be a recipe for improved operations for any tissuemaker.